It's not just about Income Tax Filing.. are they accurate ? 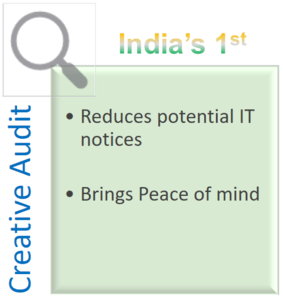 India's 1st attempt to reduce errors, notices through Creative Audit. Gives you peace of mind by reducing the possibilities for potential IT notices. EZTax.in Creative Audit, a unique India's 1st feature to analyze tax payer data against the Income Tax rules, and the real world experiences. Works by applying the taxpayer data such as current income, deductions and Taxes paid with the prevailing IT Rules, and their thresholds to simulate the possibility of erroneous data, that may trigger IT notices from Income Tax Department. In addition, this feature also rate the alert whether it is a mandatory or ignorable, along with an actionable insight, and a questionnaire that the tax payer should act upon. This makes tax payer to alter the data supplied for an error-free efiling experience.